Xamarin.Mac allows for the development of fully native Mac apps in C# and .NET using the same macOS APIs that are used when developing in Objective-C or Swift. Because Xamarin.Mac integrates directly with Xcode, the developer can use Xcode's Interface Builder to create an app's user interfaces (or optionally create them directly in C# code). Additionally, since Xamarin.Mac applications are written in C# and .NET, code can be shared with Xamarin.iOS and Xamarin.Android mobile apps; all while delivering a native experience on each platform. Visual Studio for Mac – Introduction to the Visual Studio for Mac and how to create Xamarin.Mac applications with it. 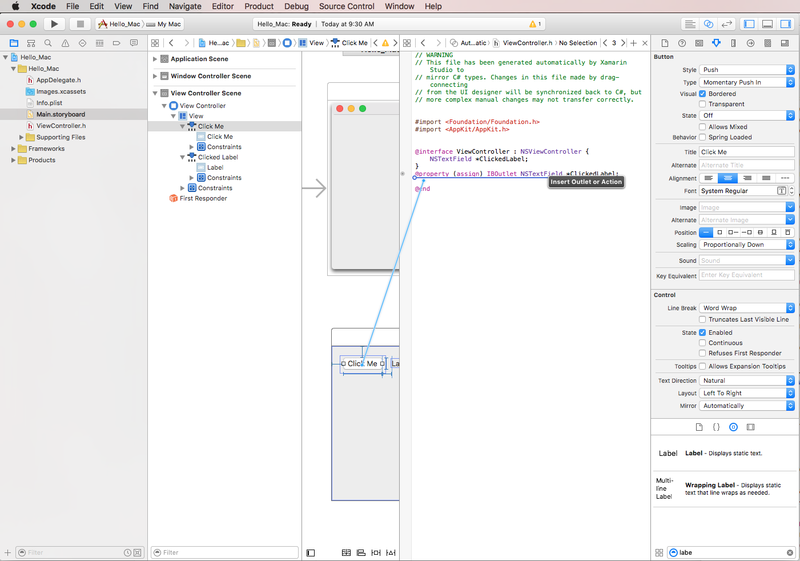 Anatomy of a Xamarin.Mac Application – What a Xamarin.Mac application consists of. 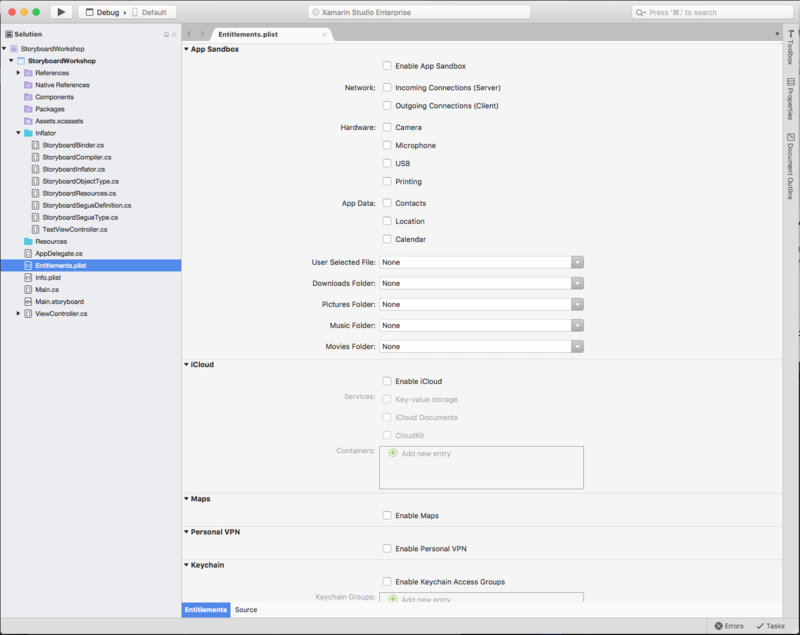 Xcode’s Interface Builder – How to use Xcode’s Interface Builder to define an app’s user interface. Outlets and Actions – How to use Outlets and Actions to wire up controls in the user interface. Deployment/Testing – How to run and test a Xamarin.Mac app. A Mac computer running macOS High Sierra (10.13) or higher. 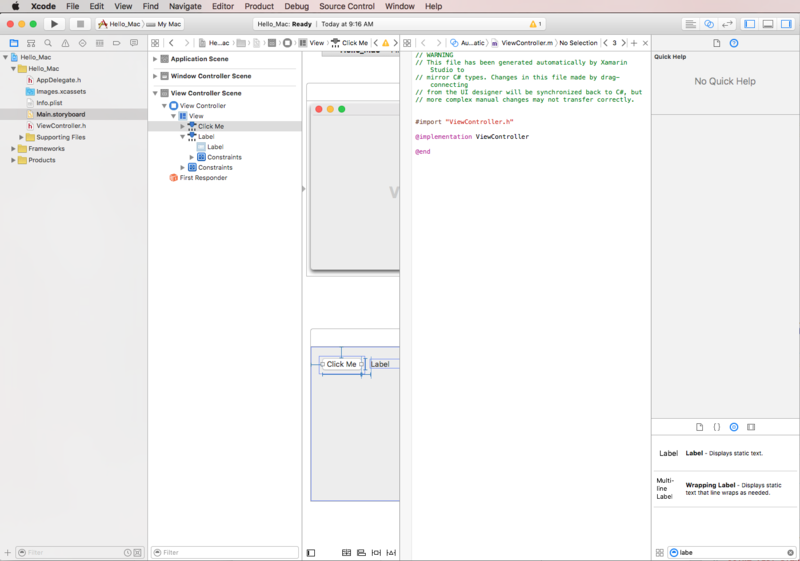 The latest version of Xamarin.Mac and Visual Studio for Mac. A Mac computer running macOS 10.7 or greater. The upcoming Xamarin.Mac 4.8 release will only support macOS 10.9 or higher. Previous versions of Xamarin.Mac supported macOS 10.7 or higher, but these older macOS versions lack sufficient TLS infrastructure to support TLS 1.2. To target macOS 10.7 or macOS 10.8, use Xamarin.Mac 4.6 or earlier. 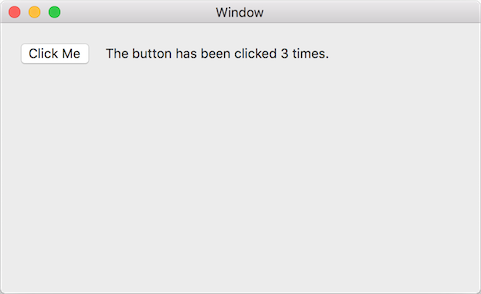 As stated above, this guide will walk through the steps to create a Mac app called Hello_Mac that adds a single button and label to the main window. When the button is clicked, the label will display the number of times it has been clicked. Visual Studio for Mac uses the same Solution and Project structure as Visual Studio 2019. A solution is a container that can hold one or more projects; projects can include applications, supporting libraries, test applications, etc. The File > New Project template creates a solution and an application project automatically. Xamarin.Mac application programming is very similar to working with Xamarin.iOS. 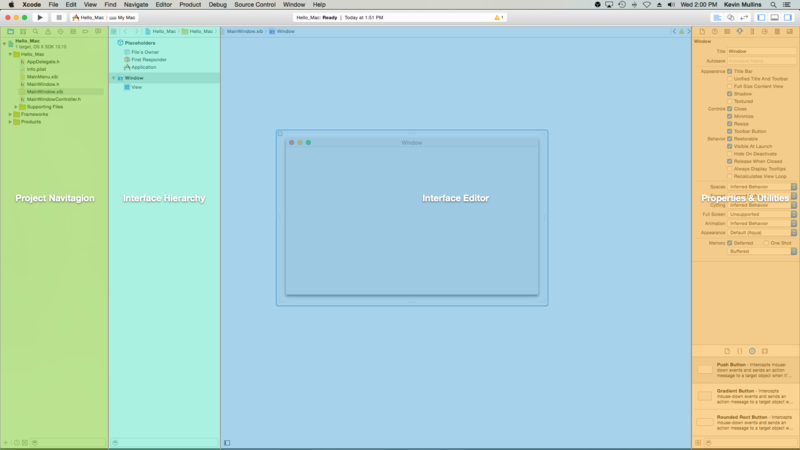 iOS uses the CocoaTouch framework, which is a slimmed-down version of Cocoa, used by Mac. Main.cs contains the main entry point of the app. When the app is launched, the Main class contains the very first method that is run. 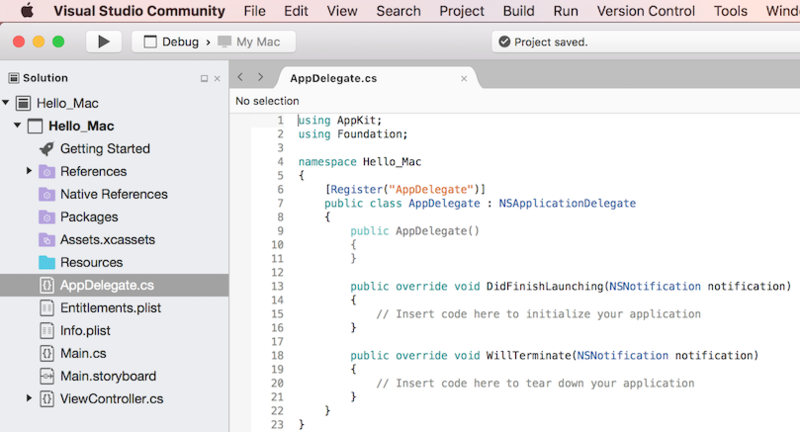 AppDelegate.cs contains the AppDelegate class that is responsible for listening to events from the operating system. Info.plist contains app properties such as the application name, icons, etc. Entitlements.plist contains the entitlements for the app and allows access to things such as Sandboxing and iCloud support. Main.storyboard defines the user interface (Windows and Menus) for an app and lays out the interconnections between Windows via Segues. Storyboards are XML files that contain the definition of views (user interface elements). This file can be created and maintained by Interface Builder inside of Xcode. ViewController.cs is the controller for the main window. Controllers will be covered in detail in another article, but for now, a controller can be thought of the main engine of any particular view. ViewController.designer.cs contains plumbing code that helps integrate with the main screen’s user interface. The following sections, will take a quick look through some of these files. Later, they will be explored in more detail, but it’s a good idea to understand their basics now. This code is probably unfamiliar unless the developer has built an iOS app before, but it’s fairly simple. The DidFinishLaunching method runs after the app has been instantiated, and it’s responsible for actually creating the app's window and beginning the process of displaying the view in it. The WillTerminate method will be called when the user or the system has instantiated a shutdown of the app. The developer should use this method to finalize the app before it quits (such as saving user preferences or window size and location). Cocoa (and by derivation, CocoaTouch) uses what’s known as the Model View Controller (MVC) pattern. The ViewController declaration represents the object that controls the actual app window. Generally, for every window created (and for many other things within windows), there is a controller, which is responsible for the window’s lifecycle, such as showing it, adding new views (controls) to it, etc. Designer files should not be edited directly, as they’re automatically managed by Visual Studio for Mac to provide the plumbing code that allows access to controls that have been added to any window or view in the app. 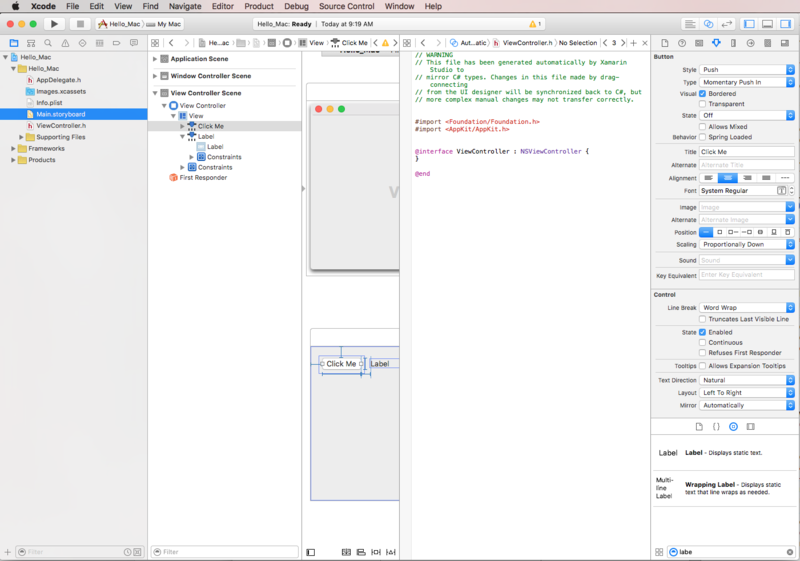 With the Xamarin.Mac app project created and a basic understanding of its components, switch to Xcode to create the user interface using Interface Builder. It also defines the Storyboard that will be used to display the user interface for the Xamarin.Mac app under the Main Interface dropdown. In example above, Main in the dropdown relates to the Main.storyboard in the project's source tree in the Solution Explorer. It also defines the app's icons by specifying the Asset Catalog that contains them (AppIcon in this case). For the Hello World example, no entitlements will be required. The next section shows how to use Xcode's Interface Builder to edit the Main.storyboard file and define the Xamarin.Mac app's UI. 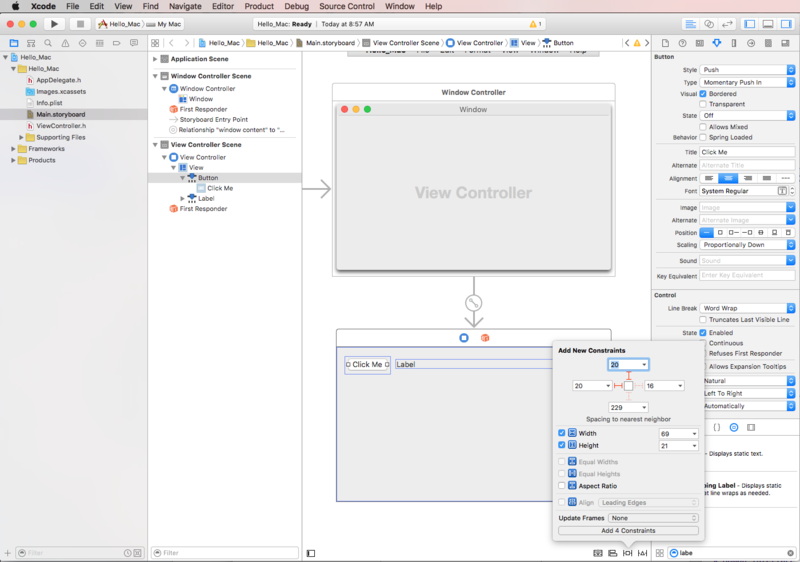 As part of Xcode, Apple has created a tool called Interface Builder, which allows a developer to create a user interface visually in a designer. Xamarin.Mac integrates fluently with Interface Builder, allowing UI to be created with the same tools as Objective-C users. Before starting to design the interface, take a quick overview of Xcode to orient with the main features that will be used. The developer doesn't have to use Xcode and Interface Builder to create the user interface for a Xamarin.Mac app, the UI can be created directly from C# code but that is beyond the scope of this article. For the sake of simplicity, it will be using Interface Builder to create the user interface throughout the rest of this tutorial. 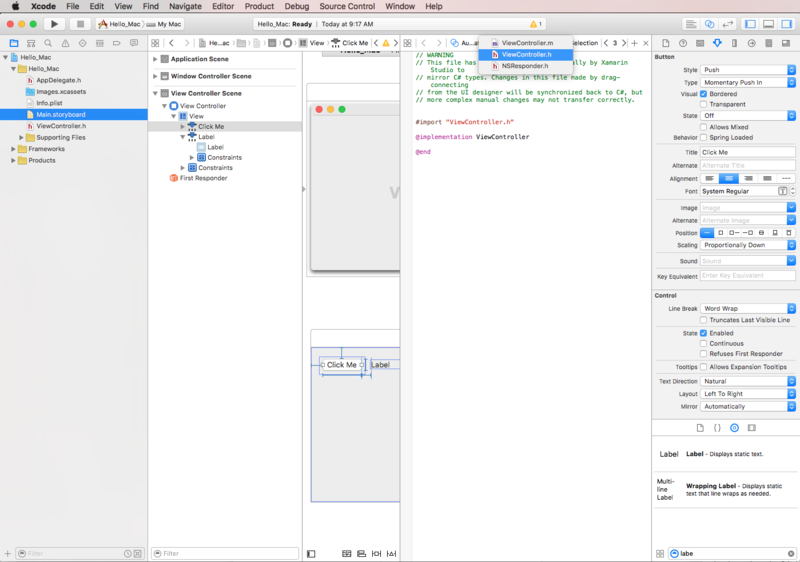 The following sections take a look at what each of these Xcode features do and how to use them to create the interface for a Xamarin.Mac app. 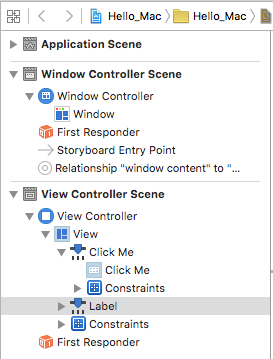 When opening a .storyboard file for editing in Xcode, Visual Studio for Mac creates a Xcode Project File in the background to communicate changes between itself and Xcode. Later, when the developer switches back to Visual Studio for Mac from Xcode, any changes made to this project are synchronized with the Xamarin.Mac project by Visual Studio for Mac. The Project Navigation section allows the developer to navigate between all of the files that make up this shim Xcode project. Typically, they will only be interested in the .storyboard files in this list such as Main.storyboard. The Interface Hierarchy section allows the developer to easily access several key properties of the user interface such as its Placeholders and main Window. This section can be used to access the individual elements (views) that make up the user interface and to adjust the way they are nested by dragging them around within the hierarchy. The Interface Editor section provides the surface on which the user interface is graphically laid out. Drag elements from the Library section of the Properties & Utilities section to create the design. As user interface elements (views) are added to the design surface, they will be added to the Interface Hierarchy section in the order that they appear in the Interface Editor. Initially this section is almost empty, however if the developer selects an element in the Interface Editor or Interface Hierarchy, the Properties section will be populated with information about the given element and properties that they can adjust. File Inspector – The File Inspector shows file information, such as the file name and location of the Xib file that is being edited. Quick Help – The Quick Help tab provides contextual help based on what is selected in Xcode. Identity Inspector – The Identity Inspector provides information about the selected control/view. Attributes Inspector – The Attributes Inspector allows the developer to customize various attributes of the selected control/view. Size Inspector – The Size Inspector allows the developer to control the size and resizing behavior of the selected control/view. Connections Inspector – The Connections Inspector shows the Outlet and Action connections of the selected controls. Outlets and Actions will be discussed in detail below. Bindings Inspector – The Bindings Inspector allows the developer to configure controls so that their values are automatically bound to data models. View Effects Inspector – The View Effects Inspector allows the developer to specify effects on the controls, such as animations. 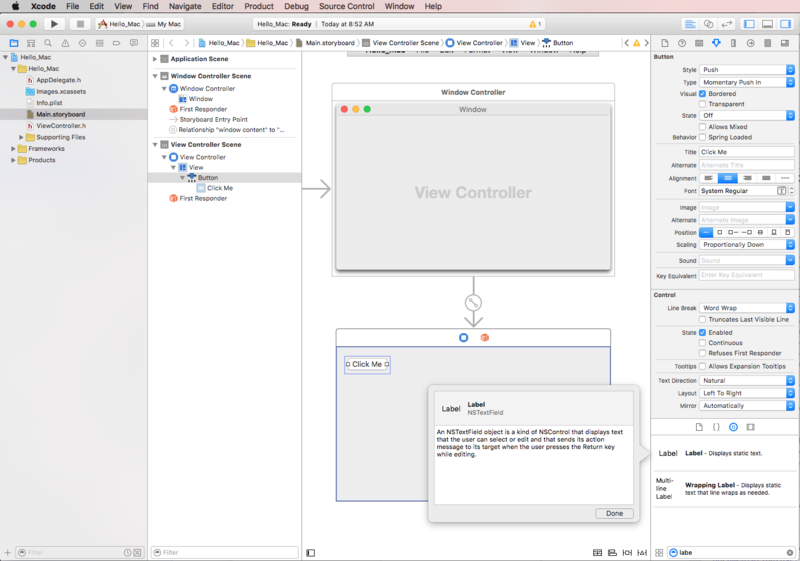 With the basics of the Xcode IDE and Interface Builder covered, the developer can create the user interface for the main view. At the top of the editor, click the Red I-Beams at the top and left. As the window is resized, this will keep the button in the same location at the top left corner of the screen. Next, check the Height and Width boxes and use the default sizes. This keeps the button at the same size when the window resizes. Click the Add 4 Constraints button to add the constraints and close the editor. By clicking Red I-Beams at the top, right and left of the Constraints Editor, tells the label to be stuck to its given X and Y locations and to grow and shrink as the window is resized in the running application. Again, check the Height box and use the default size, then click the Add 4 Constraints button to add the constraints and close the editor. Save the changes to the user interface. While resizing and moving controls around, notice that Interface Builder gives helpful snap hints that are based on macOS Human Interface Guidelines. These guidelines will help the developer to create high quality apps that will have a familiar look and feel for Mac users. From here the developer can select items to edit or drag to reorder UI elements if needed. For example, if a UI element was being covered by another element, they could drag it to the bottom of the list to make it the top-most item on the window. With the user interface created, the developer will need to expose the UI items so that Xamarin.Mac can access and interact with them in C# code. The next section, Outlets and Actions, shows how to do this. Outlets – Outlets are analogous to properties. If the developer wires up a control to an Outlet, it’s exposed to the code via a property, so they can do things like attach event handlers, call methods on it, etc. Actions – Actions are analogous to the command pattern in WPF. For example, when an Action is performed on a control, say a button click, the control will automatically call a method in the code. Actions are powerful and convenient because the developer can wire up many controls to the same Action. In Xcode, Outlets and Actions are added directly in code via Control-dragging. More specifically, this means that to create an Outlet or Action, the developer will choose a control element to add an Outlet or Action to, hold down the Control key on the keyboard, and drag that control directly into the code. This stub .h file mirrors the ViewController.designer.cs that is automatically added to a Xamarin.Mac project when a new NSWindow is created. This file will be used to synchronize the changes made by Interface Builder and is where the Outlets and Actions are created so that UI elements are exposed to C# code. With a basic understanding of what Outlets and Actions are, create an Outlet to expose the Label created to our C# code. 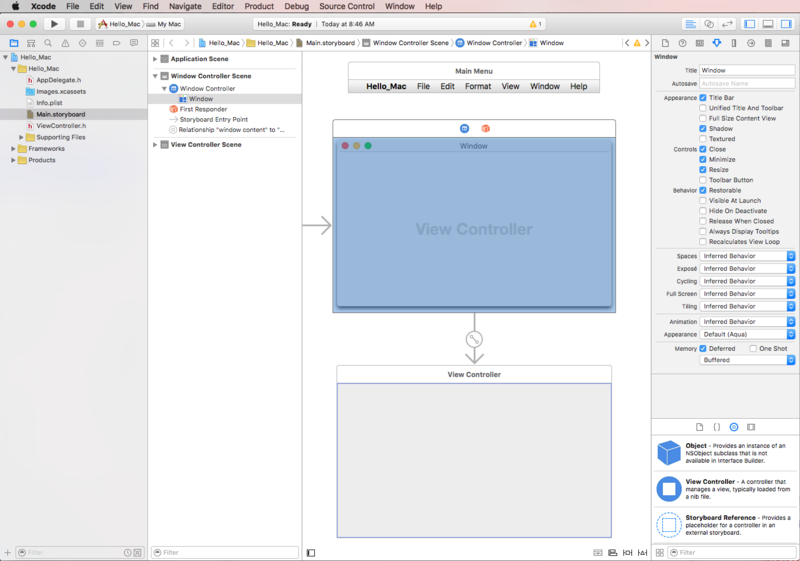 The Xcode will switch to a split-view mode with the Interface Editor on one side and a Code Editor on the other. 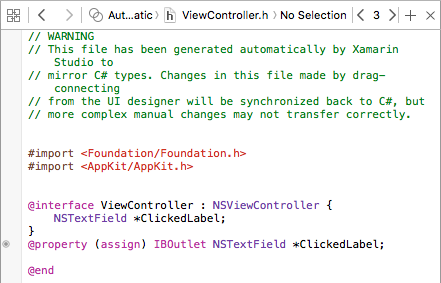 Notice that Xcode has automatically picked the ViewController.m file in the Code Editor, which is incorrect. From the discussion on what Outlets and Actions are above, the developer will need to have the ViewController.h selected. The last step was very important! : if you didn't have the correct file selected, you won't be able to create Outlets and Actions, or they will be exposed to the wrong class in C#! Next, expose the button to C# code. Just like the Label above, the developer could wire the button up to an Outlet. Since we only want to respond to the button being clicked, use an Action instead. 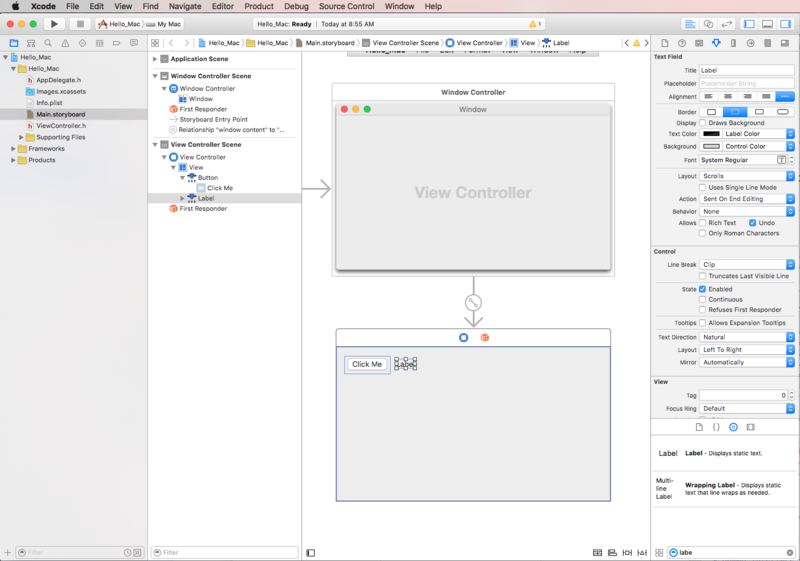 Ensure that Xcode is still in the Assistant Editor and the ViewController.h file is visible in the Code Editor. With the user interface wired-up and exposed to C# code, switch back to Visual Studio for Mac and let it synchronize the changes made in Xcode and Interface Builder. It probably took a long time to create the user interface and Outlets and Actions for this first app, and it may seem like a lot of work, but a lot of new concepts were introduced and a lot of time was spent covering new ground. After practicing for a while and working with Interface Builder, this interface and all its Outlets and Actions can be created in just a minute or two. 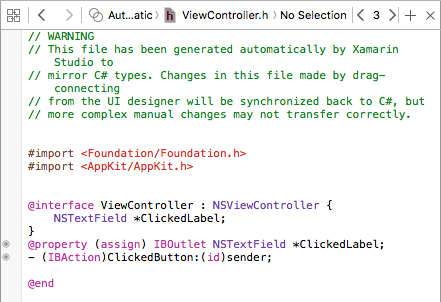 When the developer switches back to Visual Studio for Mac from Xcode, any changes that they have made in Xcode will automatically be synchronized with the Xamarin.Mac project. Visual Studio for Mac listens for changes to the .h file, and then automatically synchronizes those changes in the respective .designer.cs file to expose them to the app. 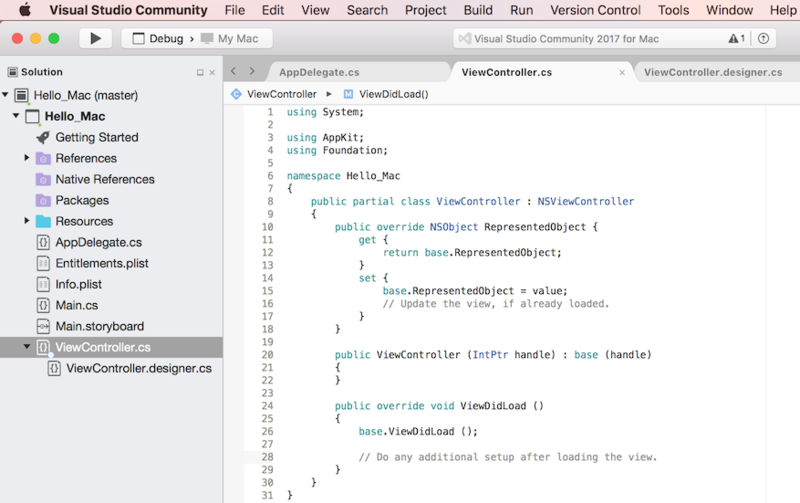 Notice that ViewController.designer.cs is a partial class, so that Visual Studio for Mac doesn't have to modify ViewController.cs which would overwrite any changes that the developer has made to the class. Normally, the developer will never need to open the ViewController.designer.cs, it was presented here for educational purposes only. 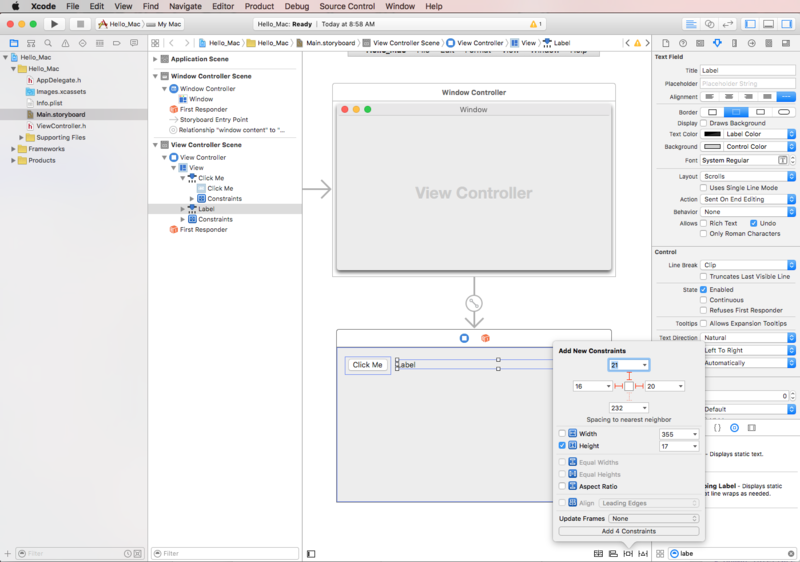 In most situations, Visual Studio for Mac will automatically see any changes made in Xcode and sync them to the Xamarin.Mac project. In the off occurrence that synchronization doesn't automatically happen, switch back to Xcode and then back to Visual Studio for Mac again. This will normally kick off a synchronization cycle. With the user interface created and its UI elements exposed to code via Outlets and Actions, we are finally ready to write the code to bring the program to life. Use ViewDidLoad, instead of another method such as Initialize, because ViewDidLoad is called after the OS has loaded and instantiated the user interface from the .storyboard file. If the developer tried to access the label control before the .storyboard file has been fully loaded and instantiated, they would get a NullReferenceException error because the label control would not exist yet. 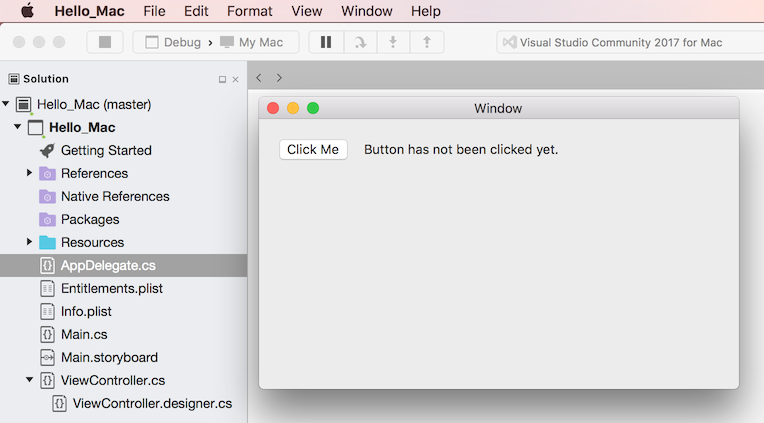 This code attaches to the Action created in Xcode and Interface Builder and will be called any time the user clicks the button. It’s time to build and run the app to make sure it runs as expected. The developer can build and run all in one step, or they can build it without running it. Debug – A debug build is compiled into an .app (application) file with a bunch of extra metadata that allows the developer to debug what’s happening while the app is running. Release – A release build also creates an .app file, but it doesn’t include debug information, so it’s smaller and executes faster. In the case of this example, we just want a debug build, so ensure that Debug is selected. Build the app first by either pressing ⌘B, or from the Build menu, choose Build All. If there weren't any errors, a Build Succeeded message will be displayed in Visual Studio for Mac's status bar. If there were errors, review the project and make sure that the steps above have been followed correctly. 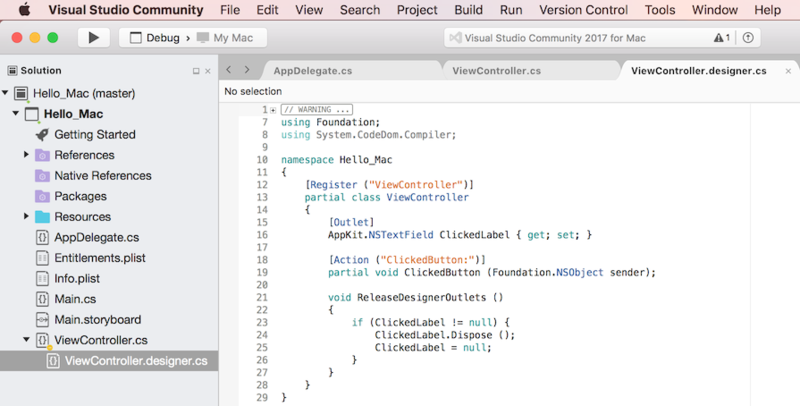 Start by confirming that the code (both in Xcode and in Visual Studio for Mac) matches the code in the tutorial. 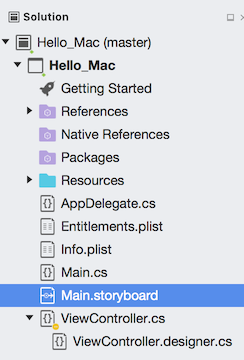 Introduction to Storyboards - This article provides an introduction to working with Storyboards in a Xamarin.Mac app. It covers creating and maintaining the app's UI using storyboards and Xcode's Interface Builder. Windows - This article covers working with Windows and Panels in a Xamarin.Mac application. It covers creating and maintaining Windows and Panels in Xcode and Interface builder, loading Windows and Panels from .xib files, using Windows and responding to Windows in C# code. Dialogs - This article covers working with Dialogs and Modal Windows in a Xamarin.Mac application. It covers creating and maintaining Modal Windows in Xcode and Interface builder, working with standard dialogs, displaying and responding to Windows in C# code. Alerts - This article covers working with Alerts in a Xamarin.Mac application. It covers creating and displaying Alerts from C# code and responding to Alerts. Menus - Menus are used in various parts of a Mac application's user interface; from the application's main menu at the top of the screen to pop up and contextual menus that can appear anywhere in a window. Menus are an integral part of a Mac application's user experience. This article covers working with Cocoa Menus in a Xamarin.Mac application. Toolbars - This article covers working with Toolbars in a Xamarin.Mac application. It covers creating and maintaining. Toolbars in Xcode and Interface builder, how to expose the Toolbar Items to code using Outlets and Actions, enabling and disabling Toolbar Items and finally responding to Toolbar Items in C# code. Table Views - This article covers working with Table Views in a Xamarin.Mac application. It covers creating and maintaining Table Views in Xcode and Interface builder, how to expose the Table View Items to code using Outlets and Actions, populating Table Items and finally responding to Table View Items in C# code. 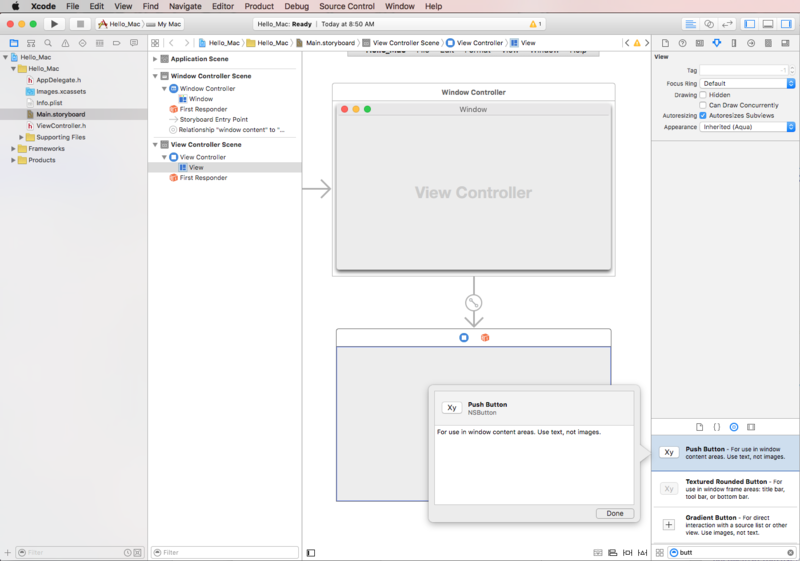 Outline Views - This article covers working with Outline Views in a Xamarin.Mac application. 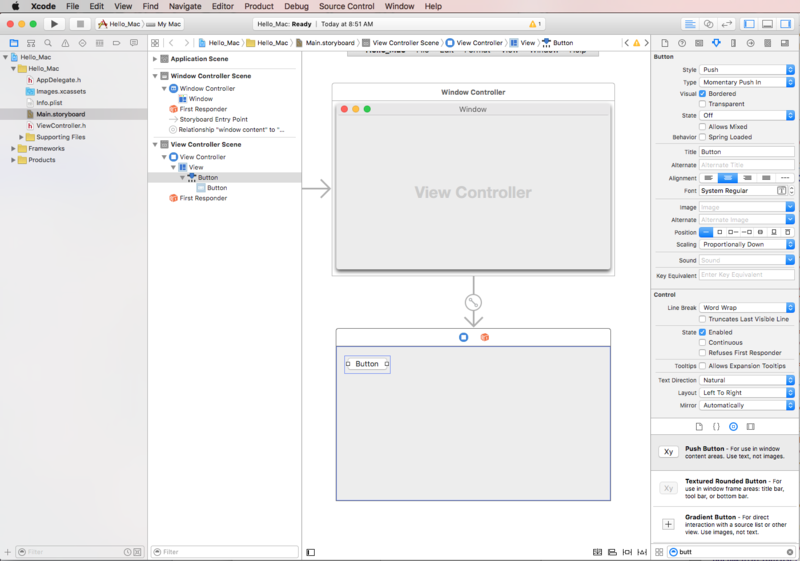 It covers creating and maintaining Outline Views in Xcode and Interface builder, how to expose the Outline View Items to code using Outlets and Actions, populating Outline Items and finally responding to Outline View Items in C# code. Source Lists - This article covers working with Source Lists in a Xamarin.Mac application. It covers creating and maintaining Source Lists in Xcode and Interface builder, how to expose the Source Lists Items to code using Outlets and Actions, populating Source List Items and finally responding to Source List Items in C# code. Collection Views - This article covers working with Collection Views in a Xamarin.Mac application. It covers creating and maintaining Collection Views in Xcode and Interface builder, how to expose the Collection View elements to code using Outlets and Actions, populating Collection Views and finally responding to Collection Views in C# code. Working with Images - This article covers working with Images and Icons in a Xamarin.Mac application. It covers creating and maintaining the images needed to create an app's Icon and using Images in both C# code and Xcode's Interface Builder. The Mac Samples Gallery contains ready-to-use code examples to help learn Xamarin.Mac. 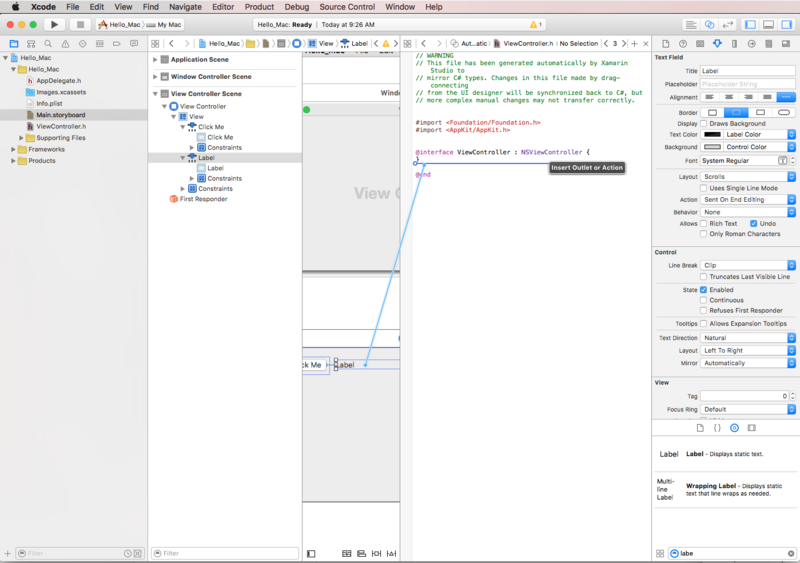 One complete Xamarin.Mac app that includes many of the features a user would expect to find in a typical Mac application is the SourceWriter Sample App. SourceWriter is a simple source code editor that provides support for code completion and simple syntax highlighting. The SourceWriter code has been fully commented and, where available, links have been provided from key technologies or methods to relevant information in the Xamarin.Mac documentation. This article covered the basics of a standard Xamarin.Mac app. It covered creating a new app in Visual Studio for Mac, designing the user interface in Xcode and Interface Builder, exposing UI elements to C# code using Outlets and Actions, adding code to work with the UI elements and finally, building and testing a Xamarin.Mac app.